Well, yes, you just ran an extra 4 miles. 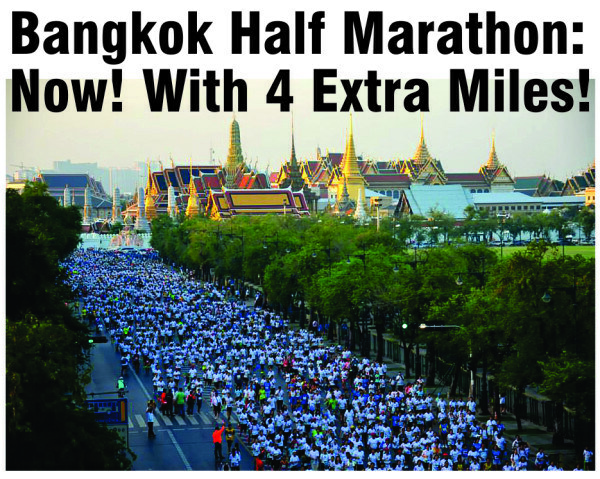 Due to a mistake in laying out the course, the Standard Chartered Bangkok Marathon was 28 kilometers instead of 17. The “Mia Culpa” to the runners came in the form of a commemorative free t-shirt with the real distance emblazoned on the front. Our promotional product company Promotionally Minded has done this sort of things for clients for a long time, but to my knowledge, only once to I'm sorry for a mistake like The Jogging Association of Thailand had to do. But commemorations are a very typical use for a promotional product. At galas honoring the guest, senior classes at a school, a concert, a sports team winning a championship – we humans are big on showing we are part of something by using a promotional product with the logo. So why not give every client a free t-shirt with our logo on it? You have to create a strong relationship with the brand, first. Would you wear a FORD t-shirt, if your family had always bought CHEVY trucks? Would you wear a really cool Coca-Cola logo shirt if you were a Pepsi Challenge winner? This brand loyalty is one of the reasons that the Disney corporation sells a few hundred million dollars in logo'd wearables a year (over half is emblazoned with the Mouse, by the way). And it is also why we give a Sedona Marketing Retreats t-shirt to everyone who we work with in our marketing boot camp intensives: We have build a strong relationship with our guests and when they head home, they will enjoy sharing they have been to the city of Sedona. But you will notice, that we highlight the city, instead of us.